Erythromycin Stearate is a macrolide, acid labile compound derived from Erythromcyin. Erythromycin is a potent macrolide inhibitor of CYP3A4 with anti-inflammatory and prokinetic properties. 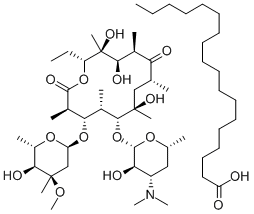 Macrolides belong to a group of antibiotics that bind to the 50S ribosomal subunit and inhibit protein synthesis. Mouse studies show Erythromycin Stearate increases IL-1 and IL-2 levels.